Ancient Tripeaks II is rated 4.3 out of 5 by 4. Rated 5 out of 5 by pennmom36 from THIS IS AN AMAZING SOLITAIRE GAME! 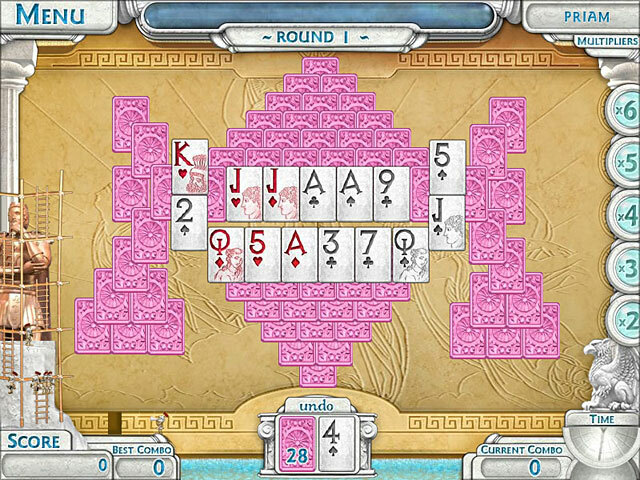 I randomly came across this game when I was looking for a new solitaire game to play, and was I surprised! 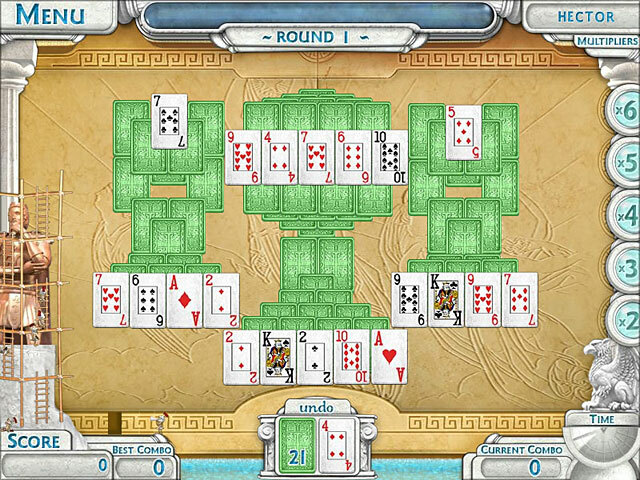 This is the best solitaire game I have ever played, and I bought it immediately. Not only did I buy it, but I paid full price for it, which is something I never do! The first feature that piqued my interest was the Greek God theme. Everything is made of stone, the look and even the sounds. You can choose from 6 different Card Back Colors and themes, and 3 Font styles of cards. More card styles are added as you reveal more statues. There are several different games to choose from, as far as layouts, in fact, there are a whopping 16 different layouts including Tri-Peaks, and a Bonus game is unlocked with each God or Goddess Statue revealed, for even more variety. You play the games consecutively, round by round, until you lose the round by not clearing all the cards. The game ends at the point, and two stone tablets open up to reveal you statistics, showinh how many rounds you completed, how long it took you, your best combo etc. and then you start over. 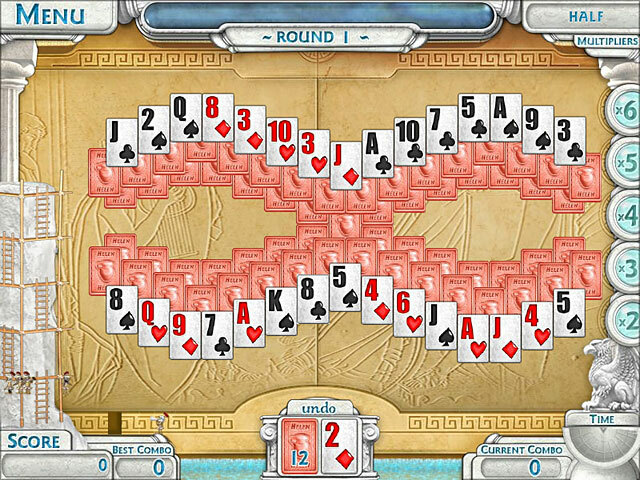 You can continue playing in one particular type of solitaire, or choose Random, to give you a different style with each round. You can choose to blay in a Power-up mode, which has bonus cards on the board, +5 Cards, Wildcard, Reveal a % of cards, Shuffle cards, +50k points, Reveal a % of the Statue, Increase the Multiplier, Freeze Time (completing levels within the time limit gives you extra points but doesn't matter otherwise) as you remove cards, the multiplier index rises up to 5X's. As you progress, there's a hunk of granit on the left and several little workers that chisel away at it to reveal the statue, which I think is cute, it also kind of reminds me of the original Tri-Peaks where the little character falls through traps, fires and dropping boulders. I love the size and style of the cards, but the only complaint I have, is that there's no custom cursor, so the system cursor being white and quite small in contrast, gets difficult to see at times. 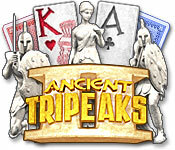 If you love solitaire games, especially Tri-Peaks, you've got to give this fantastic game a try!